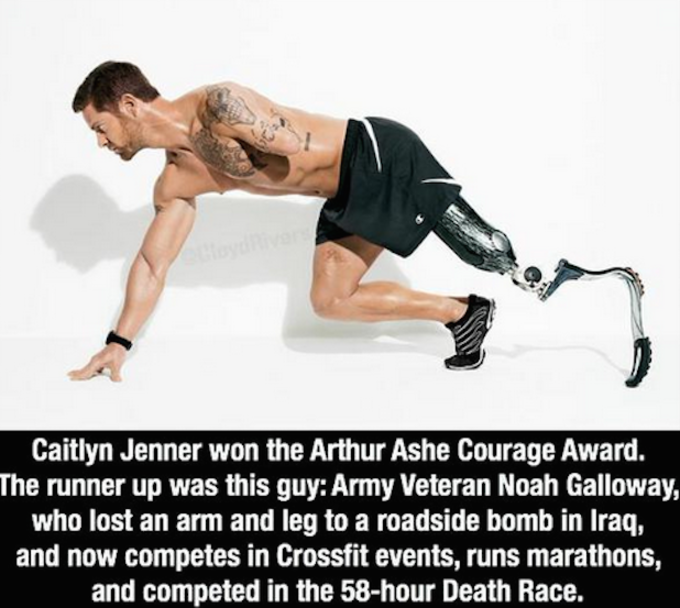 The day the world was blessed with Caitlyn Jenner&apos;s Vanity Fair cover, ESPN also announced that the former Olympian gold medalist would be awarded the Arthur Ashe Courage Award at the ESPYs this year. It was also the day this meme started circulating on social media, criticizing ESPN for its decision to honor Jenner. The meme features Noah Galloway, a double-amputee army veteran, and claims that he was second in the running for the award—a claim that ESPN has confirmed is completely untrue. Many people on Twitter and Facebook shared photos of other military members, calling them the "true" heroes. 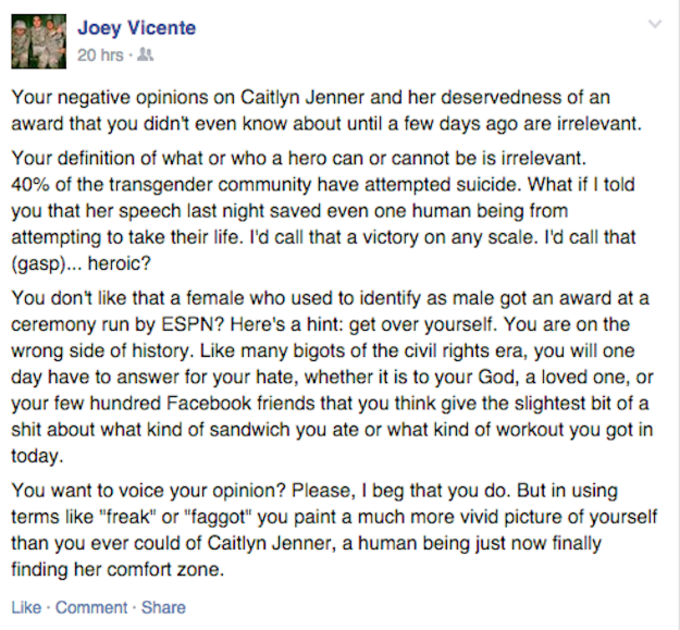 Joey Vicente, a U.S. Army soldier, wanted to respond to these guys. The 23-year-old penned this response and shared it on Facebook, shutting down anyone who doesn&apos;t think that Jenner is "heroic." Vicente reiterated what Jenner said in her acceptance speech: that trans folks are disproportionately more likely to commit suicide. "What if I told you that her speech last night saved even one human being from attempting to take their life," he wrote. "I&apos;d call that a victory on any scale." "You don&apos;t like that a female who used to identify as male got an award at a ceremony run by ESPN?" he added. "Here&apos;s a hint: get over yourself." He urged others to voice their opinions without insulting Jenner, "a human being just now finally finding her comfort zone." Vicente told BuzzFeed News he posted the response to remind other people to be more respectful on social media. He also said, "I joined the service and picked my job because I love helping people. 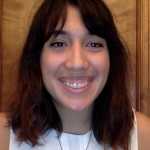 I love positivity and I love my country." Caitlyn Jenner ESPYs Speech: "Go Ahead, Call Me Names"